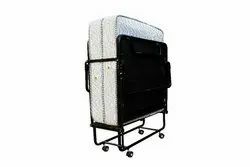 Prominent & Leading Manufacturer from Sahibabad, we offer roll away bed. MADE UP WITH 16 GAUGE 1” CRC PIPE. POWDER COATED. HALF INCH LAMINATED PLY FOR MATTRESS SUPPORT. FOUR WHEELS FOR EASILY MOBILITY. SPRING MATTRESS FOR BACK SUPPORT. 5 PLY CORRUGATED BOX PACKED.